At Oliver Heating and Cooling, we know a furnace is an important part of keeping your family comfortable during the winter. With our knowledge and expertise, we can guide you towards an ideal furnace that you can improve your comfort and lower your heating cost. 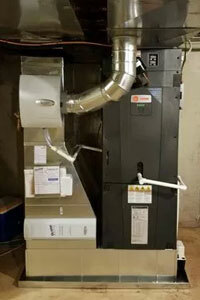 If you already have a furnace and it’s in need of service, our repair experts can fix it up quickly. We can address any abnormal smells, strange sounds, or thermostat issues to see what the cause may be. Once we determine what needs to be done, we’ll fix up your furnace and restore your comfort. When it comes to furnace types, there are a variety of options available. At Oliver, our heating experts can help you find the perfect size, style, and features. One of the most important things is finding a furnace that fits the square footage of your home. Many homes have a furnace that’s too large for the space they have. When this happens, they end up wasting energy, and pay too much. Let us help you find the right fit. We carry gas, oil, and propane furnaces that come in either single-stage or two-stage models and boast high efficiency ratings to keep your monthly bills down and lower your carbon footprint. And with our furnace maintenance plans, we’ll make sure your model is running at its optimum efficiency so you can and make the most of your investment. Whether you’re interested in a new furnace model or need a professional to take a look at your old one, our installation and repair services are here to help. Call Oliver today.